I like to call this card the Thinking Man's Stall-Out Option. Opal-Eye can virtually shut down the other player's ability to attack and deal damage. defensive card that I find hard to first pick. Letting Opal-Eye go by you, however, is a big mistake. If white is your deck's primary color, you have to draft this guy. 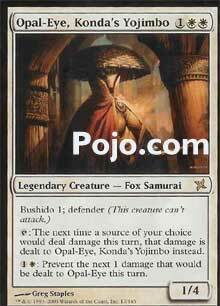 Even if you never used his activated ability for 1W that prevents the next point of damage to Yojimbo, this card will earn his place in your limited decks over and over again. In the end, while he seems extremely defensive (and he IS) Opal-Eye gives you a BIG advantage in combat, and that capability is welcome in any limited deck. In constructed, Opal-Eye is quite a bit more defensive and even slower than he is in limited. Constructed decks defensive enough to use Opal-Eye would probably prefer to play a global removal effect like Wrath of God instead of a combat-controlling creature. This guy is neat in concept, but just isn't practical. He can take damage. He can even live through the damage pretty well. Unfortunately, you need to spend mana to make all of this happen. And right now, the small white creatures are white amazing, and this guy isn't even needed. This card just screams mediocrity. I guess I can't *really* complain about a creature that is a 2/5 when blocking and that prevents damage to itself, but the fact that it has defender bothers me enough to not include it in many decks. The redirection ability attached to Opal-Eye means that it simply becomes the primary target as opposed to you as soon as you drop it, so don't be surprised when it dies within a turn or two. All in all, no matter what format, this card is decent, but not great. Hmm... an interesting wall that can absorb damage heading your way. It's not a bad idea, but it does have a couple things going against it that make it not really playable in constructed. First, it's a defender (wall), so it can't attack. Next, to use its ability, you need to tap it. So if a creature attacks you, and you want Opal-Eye to absorb the damage so you tap it, then your opponent Fireballs you after combat with lethal damage, sorry, but Opal is already tapped and can't take the heat. Next is its cost. 2 mana would be better, but 3 is a bit much, and along with it's 1W preventing, Opal-Eye tends to be a bit mana intensive. But the time you have enough to make it work well, your opponent may be throwing enough damage your way that it could take Opal-Eye out. Meh. So, for constructed, it just doesn't work well. In casual, it's a bit boring. In limited, I would play it if I were going white, as it could hold the fort for you for a while.